In the undiscovered era known as Croodacious, the creatures and landscapes are unlike anything our world has ever known. Mother Nature is still experimenting and has yet to invent the flora and fauna we know today. 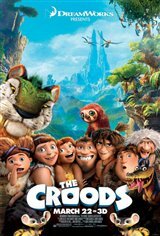 One day, an earthquake strikes this volcanic world and a caveman named Grug (Nicolas Cage) and his family are forced to leave everything behind in search of a new home. Things soon turn from bad to worse when Grug and his family come across a nomad named Guy (Ryan Reynolds) and Grug’s oldest daughter (Emma Stone) falls for him. Things continue to get complicated when the nomad’s search for "tomorrow" comes at odds with Grug’s reliance on the traditions of yesterday.